The racing fun began at Kingfisher Ultra Indian Derby - 365 Festivals :: Everyday is a Festival! If you really in need of some enthralling then guess what Kingfisher Ultra Indian Derby is all set for a new season. It’s a horse racing event in case you heard it for the first time. Undoubtedly, horse racing is a thoroughly liked sports. Men and Women together show interest in attending such event. The spectacular view of the game where the finest horse breeds are competing on the racing track is genuinely spellbinding. Moreover, the Kingfisher Ultra Indian Derby marked a notable event of the years. If you are out of curiosity regarding this event, here are essential details which give you some understanding about it. 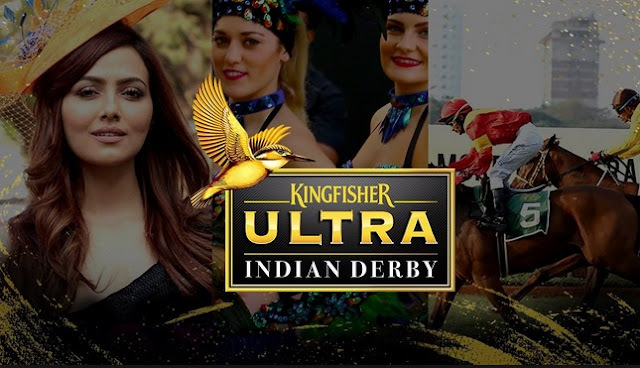 Kingfisher Ultra Indian Derby is a premier sporting event in India which occurs annually. Horseracing lovers wait for its every season that arrives on the first Sunday of February. Unlike other horse racing event organized across the globe this event scheduled for only one day. Moreover, the venue of this event remains fixed, and it is Mahalakshmi Racecourse situated in Mumbai. One of the most famous and dated horse racing events in India drives tremendous spectators. And if you think this is it, then you have no idea of what the winner is going to get. Speaking about this, the prize money given to the winner is even more eye-catching. Believe it or not, the winner here entitled to prize money worth 3.6 crore Indian rupees. Some significant historical facts regarding this event, are here for you. This unique sporting event is older than your imagination. The first time it took place was in 1943. So, all in all, it completed 74 years where each of year is an addition to its popularity. Moreover, initially, its name was McDowell’s Indian Derby that later changed to Kingfisher Ultra Indian Derby. The change occurred as a result of changing sponsorship. From United Spirits Limited the sponsorship handed over to United Breweries Limited. The horse racing event is of type Thoroughbred. Furthermore, a thoroughbred racing involves racing game between Thoroughbred horses. Thoroughbred racing further divides into two types Flat racing and jump racing. The first Sunday of February gathers a massive crowd at the Mahalakshmi Racecourse. Moreover, the inaugurated event in 1943 which marks its commencement won by the filly Princess Beautiful. The Pesi Shroff was the jockey who receives the title of winning the most races summing up to total eight races. Out of this eight-win, he managed a hattrick win during the year 1989 to 1991. Undoubtedly, he bagged the title of the most successful jockey of all time. However, he could not make up to the ninth title as his horse founded guilty of dope. If you ask about the trainer record, then Rashid R. Byramji was the topper of all of them. He was the 11 times winner in Indian Derby. The event also assembles pretty ladies on its celebration. Ladies wearing glittery and expensive dresses with hats add glamour to it while making men to turn their head. Moreover, there are so many things to like about this event if you haven’t been to it. There is nail-biting competition happening in the lush green arena. Also watching the top breed horses of the world is a delight. If you are there for the first time and want to bet on any horse here is what to do. To get all the correct information about the horse you can buy books available there at the store. It’s a cheap deal which you can get on 20 rupees only. There are three books namely BOL, Cole and Lucky Spinner which provide every fact and figure about the horses set for this game.